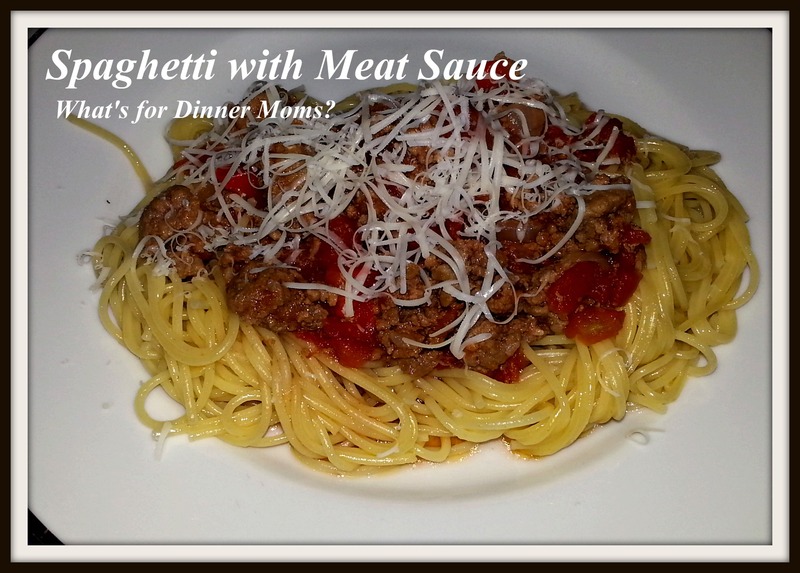 Spaghetti with Meat Sauce – What's for Dinner Moms? Someone was mentioning to me the other day that they were looking at recipes but most of the recipes they looked at didn’t have ingredients they had on hand, especially spices. Having a basic spice cupboard is a good idea if you are looking to cook more at home. No, you do not need to buy the $20 bottle of some exotic spice but rather a cupboard of basic spices that you can substitute in a recipe for those you don’t have. The more you cook the more you will become familiar with spices and what works together in a recipe and for your families tastes. There are more you can add but these are the staples I must always have on hand. Last night our dinner was a freezer special. I made the meat sauce awhile ago and froze it for nights like last night. I made enough sauce for three meals during the month. I had it thawing in the refrigerator so that when we were ready I boiled the pasta and warmed the sauce. This sauce would be good over ravioli, in a lasagna or as the base of casserole. It was great. It was meaty, hearty and filling. Both kids were so excited to have something as simple as spaghetti and meat sauce. They each ate two plates. I served this with a green salad and a side of green beans. Add olive oil to the bottom of a large stock pot over medium heat. Add the garlic and cook for 1-2 minutes until it become fragrant. Add onions and peppers to pan. Stir until onions start to soften. Add ground beef to pan. Cook meat breaking it into small pieces with the side of the spoon as it cooks. Meat should be browned through when done. Drain off any excess grease from the pan. Add red wine to the pan and allow to cook down for 3-4 minutes. Add diced tomatoes, oregano, salt and pepper to the pan. Stir well. Allow to heat through for 35-45 minutes. Sauce should reduce and simmer slowly. If it comes to a rapid boil reduce heat. If sauce is too thick add a bit of chicken stock to thin. Sauce may be frozen in an air tight container and frozen once it has cooled or it may be served with your favorite pasta.